At Walter’s Mercedes-Benz of Riverside, we understand that you don’t always have time to schedule a service appointment and wait at the dealership. That’s why our Mercedes-Benz dealership near Corona, CA, offers Mercedes-Benz Express Service! If you need Mercedes-Benz A Service or Mercedes-Benz B Service, you can visit our Riverside Mercedes-Benz service center and get back on the road quickly. 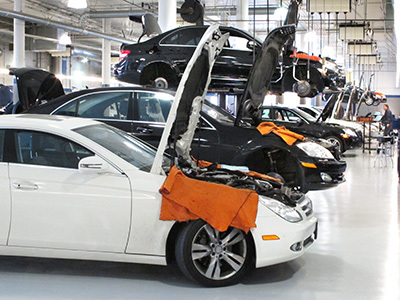 Wondering what’s covered in Mercedes-Benz A Service or B Service? You can learn more about Mercedes-Benz A Service and B Service intervals before visiting us. We perform other services as well, so don’t hesitate to stop by today for all your auto maintenance needs! We offer plenty of services to help you save time and get you back on the road. When you opt for Express Service, you receive a complimentary multi-point inspection and battery test with every service visit, and we’ll do a complimentary tire inspection and reset the tire pressure if needed, too. Additionally, all fluid levels are inspected and filled as needed, which helps keep your engine, and your vehicle, in top condition. Stop by the Mercedes-Benz service center near Ontario today and take advantage of our Express Service offerings and get back on the road faster! Head over to our Mercedes-Benz dealership near Redlands and let our expert Mercedes-Benz service technicians take care of your vehicle quickly and efficiently. Instead of visiting a nearby mechanic, trust the professionals and service your Mercedes-Benz with those who know your vehicle inside and out. We look forward to seeing you soon!